KRONENWETTER — Jim Harris’ career has taken an unlikely trajectory and has now come full circle. Since retiring as principal of Weston Elementary School in 2003, Harris, 63, of Kronenwetter developed a nonprofit organization called We Help War Victims. 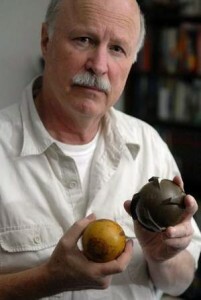 He and a crew he hires spend three months of the year finding and disposing of unexploded bombs dropped by American planes on northern Laos during the Vietnam War. Harris returned from his most recent trip last week. He’s still teaching, though, and has developed a significant relationship with one D.C. Everest Middle School seventh-grader. As part of his efforts to clear Laos of bombs, Harris often gives presentations in local classrooms. After speaking to students at D.C. Everest Middle School, he impressed them so much that the school’s Leadership Institute raised more than $4,000 by selling lollipops to fund Harris’ efforts, putting the students at the top of the list of donors for the organization. “We say we’re clearing Laos of bombs, one sucker at a time,” Harris said. He is grateful for the support, so he wanted to involve them in his work. He began calling one of the student leaders, Jack Collison, 13, of Schofield, to talk about his mission. Harris called him about six times over the past couple of months, often from the field where he was removing bombs. One of the highlights for Collison was that he got to do the countdown for blowing up a bomb with Harris and his crew via cell phone. Collison heard the explosion, which, of course, was cool. The incident was significant for Harris, because a Lao boy Collison’s age found the bomb and reported its presence. “It’s so heartwarming for me to see two kids in wildly different environments, but both are really responsible young men,” he said. Collison is learning more about the world than he imagined, and it’s having an impact. “I might actually go to Laos one day and do what Mr. Harris does,” he said.